With June 4—the 24th anniversary of the Tiananmen Square massacre—approaching, petitioners streamed into Beijing on Friday, only to be met by police who quickly hustled them on to waiting buses and then stuffed them into black jails. Boxun, a dissident website, put the number of petitioners present at up to 10,000, but the number is impossible to confirm. Petitioners regularly travel from around China to the capital to make known their grievances against local authorities. Common issues they highlight include land grabs, what they consider to be unjust court judgements, and corruption. According to the estimates of two eyewitnesses on May 31, around 1,000 petitioners, at least half of them from Shanghai, were packed into buses and driven away, some of them to be placed in black jails. Two factors led to the large number of people, according to an individual familiar with the matter, speaking to Civil Rights and Livelihood Watch, a website that keeps a close eye on petitioners: the last Friday of every month has come to be seen as a day for petitioning, and the impending anniversary of the June 4th massacre has brought more people to the streets. Oriental Daily, a Hong Kong publication, said that there were over 20 large buses parked nearby the Office for Letters and Appeals, for the petitioners to be placed in. At least two people were badly beaten by police on the scene, the Daily said. 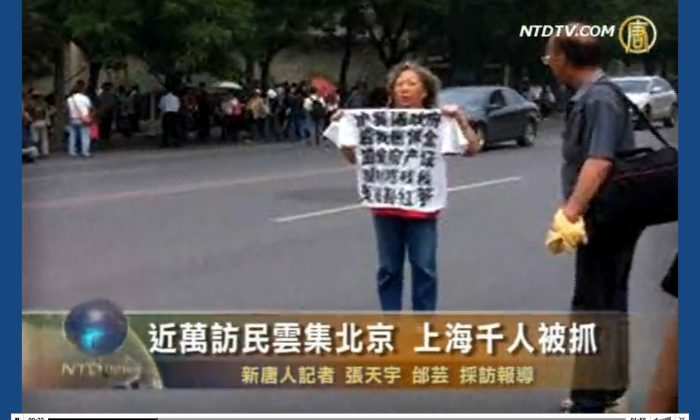 Kong Lingzhen, a petitioner from Shanghai, told NTD Television that there were around 1,000 Shanghai petitioners there on May 31. “The police at the Appeals Office arrested us and put us on a bus to Jiujingzhuang,” a major black jail in Beijing. Black jails hold petitioners and others, and operate outside the legal system. Hu Jianguo, another petitioner, said that around 500 people were packed into buses and taken to another black jail. Sound of Hope Radio said that many petitioners reported being threatened by police not to travel to Beijing over the next week or so, given the proximity of the June 4 anniversary, a date considered highly politically sensitive by Communist Party leaders. Tang Jingling, a civil rights lawyer based in Guangdong, told The Epoch Times in an interview that the Chinese Communist Party is currently in a form of “martial law” before the June 4 anniversary, and that their security forces are on high vigilance. As part of the preparations for the anniversary of the massacre, the authorities have also carried a high-profile “Internet cleansing” movement, closing down more than 800 websites said to carry “obscene content.” The cleansing will last until the end of June; activists suspect that politically undesirable websites are the primary targets for the campaign.